Nissan Motor Co., Ltd. together with its affiliates, Autech Japan, Inc. and Nissan Motorsports International Co., Ltd. (NISMO), will present 16 models at the Tokyo Auto Salon 2008 with Nippon Auto Parts Aftermarket Committee (NAPAC), to be held at Makuhari Messe from January 11-13, and the Osaka AutoMesse 2008, to be held at INTEX Osaka from February 9-11, 2008. The GT500 specification Nissan GT-R racing car, to be entered in the 2008 SUPER GT series, will make its first public appearance at the Tokyo Auto Salon. The new ‘works’ livery – which will be featured across Nissan’s motorsports activities during the 2008 season - will be unveiled on this car. Nissan will challenge for the SUPER GT Championship, one of the world’s most demanding GT race series, with the new machine built on the same multi-performance super car concept of the Nissan GT-R road car. * Skyline Aero Package Concept: This exclusive motorshow edition was specially customized to offer enhanced driving pleasure with dynamic front and rear spoilers, re-designed sporty front grill and chromed alloy wheels. * X-TRAIL “X-TREMER Package” Stretched (concept model): Built on the tough utility of the X-TRAIL SUV, it exaggerates the ruggedness of the base model with under covers on the front and rear, custom extra-large fog lamps and 18-inch chrome alloy wheels. * Other vehicles to be exhibited include Skyline Coupe Aero-Sports Concept featuring aggressive new exterior and interior looks with new aero parts and Seat materials, and Fairlady Z Type F (further details to be announced on January 10th). * Dualis Premium Concept: This exploratory design model combines the appeal of an SUV with the hatchback, delivering high performance and luxurious feel. Special features include LED-illuminated front molding, special front and rear bumpers, over-fenders, 19-inch alloy wheels and low down suspension. * Rider High Performance Series: Two models launched in Japan last year to commemorate the 10th anniversary of the Rider series this February 2008 will be exhibited – Elgrand Rider High Performance Spec and Serena Rider High Performance Spec. Both vehicles are equipped with specially tuned suspension, engine and stiffer body structure. Note Rider High Performance Spec will also be on display (details to be announced on January 9th). * Other models to be exhibited in the Autech area include Cube Rider 10th Anniversary edition, launched in October 2007 in Japan, equipped with specially designed front grill and kicking plate; Caravan Rider (concept car) with sporty exterior and low down suspension; X-TRAIL Axis renewed last August. * Tiida S-Tune PROTO: this concept car delivers enhanced speed, ride and handling for an exhilarating drive. Details will be announced later this month. * Other models will include XANAXI NISMO Z (SUPER GT 2007 GT500 Class), ENDLESS ADVAN Z (series winner of the Japan’s SUPER TAIKYU 2007 endurance series) and Fairlady Z Version NISMO Type 380RS. 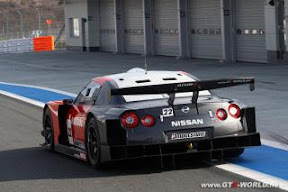 * NISSAN GT-R race car (SUPER GT 2008 GT500 Class) to be scheduled for SUPER GT debut in March in Suzuka Circuit. Nissan merchandise goods will be available for sale at the Nissan booth. The extensive range covers 300 items, including apparels, accessories and miniature cars, under the NISSAN, Nissan GT-R, Fairlady Z, Skyline and NISMO brands.